Population growth had exceeded the limits of the agricultural economy by 1300 and became unsustainable. Although agricultural productivity had increased in the High Middle Ages, population growth had exceeded the limits of the agricultural economy by 1300. 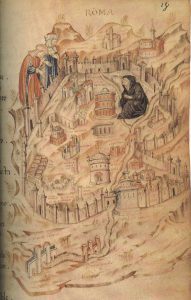 Part of the problem was that the world climate began shifting again in the mid-1200s. Average temperatures cooled slightly, shortening the growing season. Patterns of rainfall changed dramatically: it now rained much more, with frequent huge storms and floods. Agriculture became unsustainable in far Northern Europe, and in the rest of Europe productivity dropped significantly. Soil exhaustion added to these climatic problems. 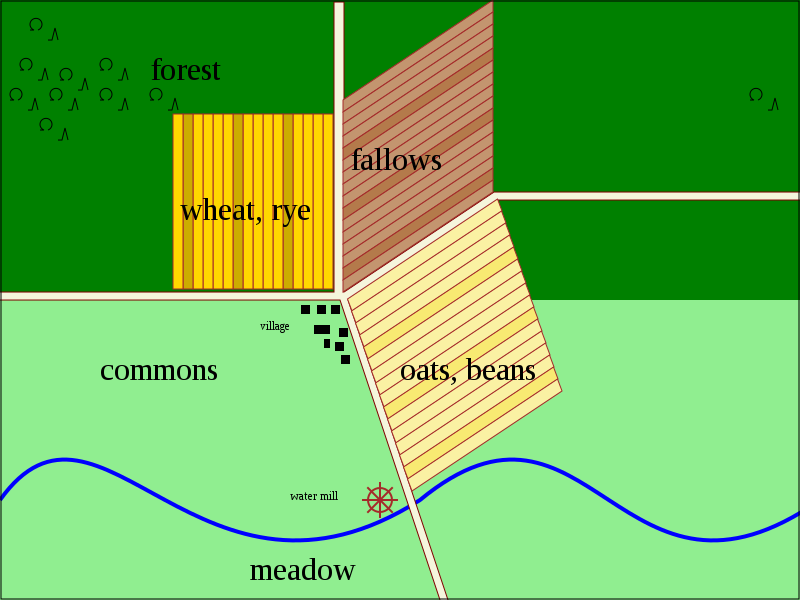 Although the three-field system had slowed this process, generations of intensive farming had simply drained the soil of nutrients to the point that productivity declined (compared to the 1100s, farmers reaped a smaller harvest in relation to the amount of seed they had sown). The most dramatic cases of soil exhaustion were on newly settled marginal lands, which had been cultivated as the population expanded. The sum effect of declining productivity was food shortage in the best years of the 1300s and famines in the worst years. In the 1300s Europeans faced the constant threat of famine—mass starvation. Harvests had been poor and mass hunger a serious danger in 1305-1314; then, in 1315-1322, famine devastated most of Europe. 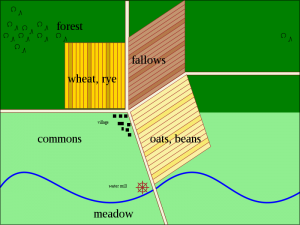 Spring and Summer floods led to crop failures, so that peasants had absolutely no surplus grain to sell at market in fall 1315; things were so bad in winter 1315-1316 that peasants ate the seed that they had stored for the Spring planting. Therefore they had little to plant in Spring 1316, which together with bad weather made that another famine year. It took more than five years to break this cycle. Making matters worse was a wave of “epizootics” (epidemic diseases among animals) that destroyed much of Europe’s livestock. This not added to the problems of agriculture by killing off draft animals, but also deprived people of meat and dairy products. The results of starvation were devastating. Tens of thousands of people simply starved to death. Epidemic illnesses carried off tens of thousands more whose resistance to disease had been weakened by hunger. At least one in every ten people in Europe perished in the famines and epidemics of 1315-1316. Still, the population exceeded Europe’s agricultural capacity. With demand high and grain supplies low, prices for food soared. Although the wealthy aristocracy continued to live in luxury and seldom went without, hunger remained a constant for the mass of the rural and urban poor. In 1347, though, a new plague struck Europe and hit rich and poor alike: the Black Death. Although there is some debate among historians as to the epidemiology of the Black Death, most historians argue that this was the Plague (in two forms, bubonic and pneumonic). According to the dominant theory, the Plague had begun in Mongolia then in the early 1300s was carried by rats and fleas to lands that the Mongol armies had conquered in the previous century–China, Northern India, and Russ. Italian ships trading with the Russ cities on the Black Sea had accidentally transported disease-carrying rats and fleas back to Genoa. The disease then spread along trade routes through Italy and into Western and Central Europe. Those bitten by infected fleas died horrible deaths within a week’s time; those who inhaled the virus died much more quickly but no less horridly. Within a generation, Plagued had killed off 40 percent of the English population and nearly 60 percent of the population in Northeastern France. The only escape from Plague seemed to be to flee infected districts completely. The mass of death and the flight of populations further undermined agriculture and added to the constant threat of famine. The governments of France and England added to these natural calamities by carrying out a series of long, deadly wars, which are known collectively as the Hundred Years’ War (1337-1453), and which aggravated the problem of agricultural decline. 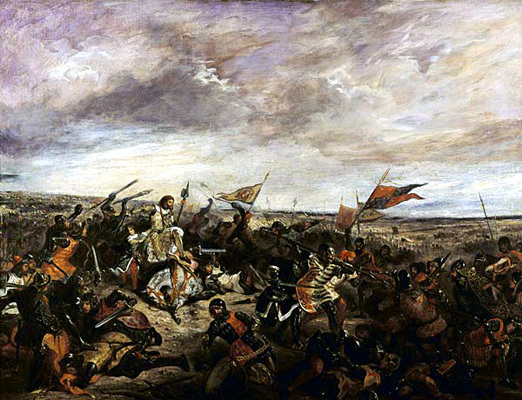 The Hundred Years’ War had its roots in three situations: the English kings’ continuing claim to territories in France and the efforts of the French crown to push them out; English support for the Flemish rebellion against French rule; and a succession crisis when both English King Edward III and the new French King Philip Valois (Philip IV) both claimed to be the rightful successor to the French Capetian King Charles IV died without an heir. The war took place entirely in France, and contributed to the loss of lives and farmland. Famine and disease, and especially the Black Death, hit the towns as hard if not harder than they did the villages. If anything, sanitary conditions in the towns were even worse than in the countryside, and overcrowding contributed to the rapid spread of epidemics. Some cities (like Milan and Nuremberg) escaped the devastation of the Black Death, but in London and many other great cities as many as half of the population died of the disease. 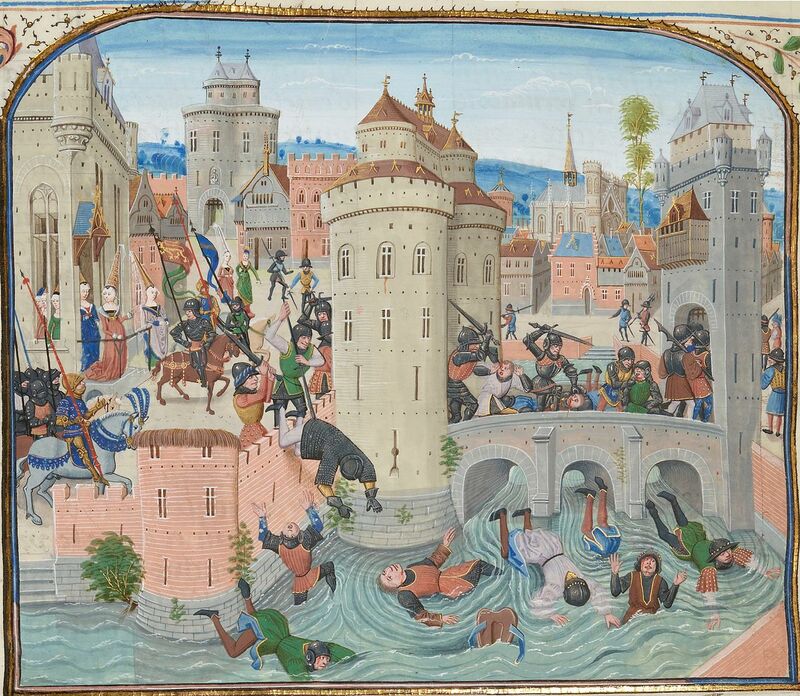 In France, the ravages of the Hundred Years’ War added to the death toll. The huge costs of warfare and the collapse of agricultural production and trade took their toll on the urban economy as well. 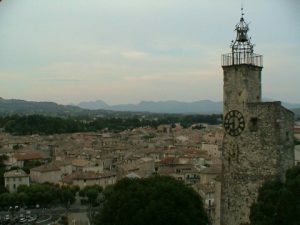 In the mid-1300s, France and England both refused to pay off loans made by the great urban banking houses of Italy, which led to financial crisis and collapse in Florence and Sienna. 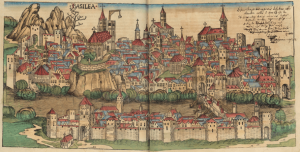 Banking failures disrupted the flow of capital to other merchant enterprises, and worsened the depression that gripped most of Europe’s cities in the 1300s. Yet in the long run, towns and cities would rebound and even benefit from the effects of the crisis of the 1300s. [The peasants] assaulted a strong castle, seized the knight and bound him hand and foot, and, before his eyes, violated his lady and their daughter, then killed the lady who was with child, and the daughter, and the knight and all the children, and set fire to the castle. They did likewise in several castles and good houses….. Knights and ladies, squires and damsels everywhere fled where they could… Thus did these folks [the rebels], having assembled without leaders, burn and rob, kill gentlemen and noble ladies and their children, and violate ladies and maidens without mercy. While this account is from an aristocrat, who had an interest in portraying the rebels as criminal and animalistic, it is clear that the uprising posed a threat to both the royal government and the aristocrats. The aristocracy therefore joined the government in crushing this threat to their power, and by fall 1358 had drown the rebellion in blood. A generation later, in 1381, peasants rose up in mass rebellion in England. Again, the rebellion was aimed as much at the aristocrats as it was at the crown. By the 1380s, population decline in England had created a labor shortage, which should have resulted in higher wages for agricultural labor. But the aristocrats used their power in Parliament to enforce a freeze of wages at early-1300s-levels, and also demanded more work from serfs under their control. When the royal government then tried to impose new, high taxes to pay for the latest rounds of the Hundred Years’ War, the peasants rebelled, as did artisans and many other townspeople. The rebellion began in Essex in May, then spread to Kent and Canterbury. Rebels first attacked the persons and property of the aristocratic landlords and the tax collectors (and their records); they then marched on London and the royal government in June. Young King Richard II diffused the situation by promising the rebels that he would revoke laws that had kept wages low and rents high; he also promised to abolish serfdom. The rag-tag rebel army dispersed. Richard then ordered its leaders arrested and executed, and by August the last embers of the rebellion had been put out. Richard kept this first promise and lifted laws artificially depressing wages and bolstering rents. He did not abolish serfdom, but serfdom nonetheless faded away completely in England in the early 1400s. The rural population was not alone in rising in rebellion during the crisis decades of the 1300s. On several occasions, artisans and the urban poor spontaneously rose in protest against hunger and against the upper classes (especially the aristocrats), who lived in luxury and used their political power to keep wages low. 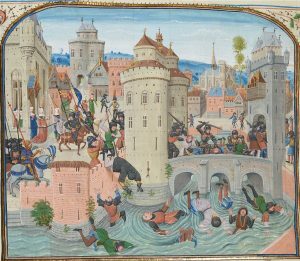 In 1358, the year of the Jacquerie, artisans and the poor in Paris protested against low wages and high rents (which made the Jacquerie all the more threatening); the crown responded by executing apparent rebel leaders in Paris, Toulouse, and other cities. In 1378-1383 urban unrest reached its height: in those five years, there were riots and unrest in a dozen cities in France (including Paris); a serious revolt in Ghent in Flanders; rebellions in Dantzig, Brunswick, and Lubeck in Germany (there was another rebellion in Lubeck in 1408); and a rebellion in Florence (the Ciompi rebellion, discussed in Coffin, p. 391). While some of these rebellions had clear political aims, they are probably best seem as expressions of outrage and frustration at gross social inequities in times of extreme hardship. One common response to the multiple disasters and hardships of the 1300s was to conclude that God was passing judgment on mankind’s sins. This was not a surprising response given the new trends in popular Christian practice. Tens of thousands of devout concluded that the Church had failed to satisfy their spiritual needs, often because they saw the clergy as too worldly. One very common means of filling this spiritual hunger was to engage in pilgrimages to holy sites (which became much more common in the 1300s). Another was to follow the example of early Christian hermits, who thought that punishing the flesh was a means of feeding the spirit: these were the flagellants, who joined self-mutilating and self-beating sects (which also proliferated in the 1300s). While some Europeans sought to beat sin out of themselves, others became absorbed in mysticism, which led (in the Church’s view) to heresy. 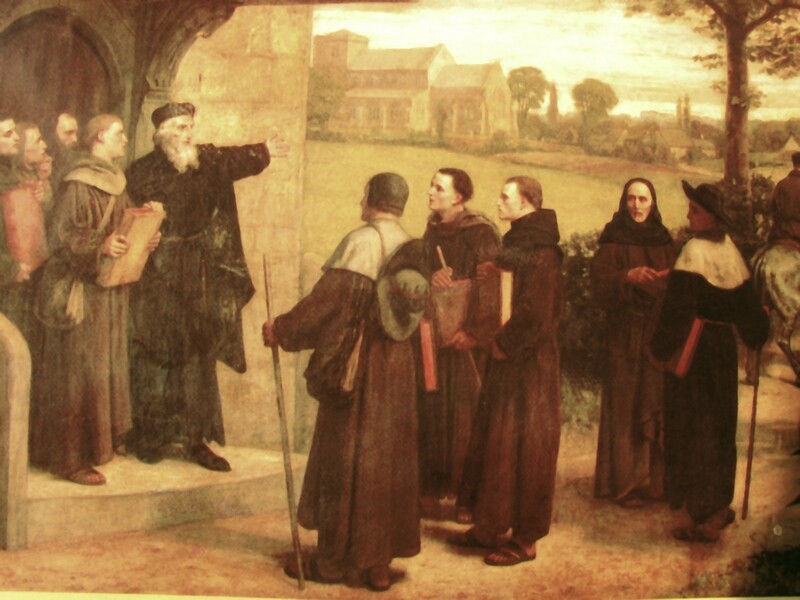 Following the writings of the Dominican priest Master Eckart (1260-1327), for instance, many faithful believed they could commune with God by turning their back on the worldly and meditating on “the spiritual mysteries of Christ.” The Church recognized that such views implied that man did not need the Church or the priesthood to achieve salvation, and eventually condemned the circle of Eckart’s disciples for the “Heresy of the Free Spirit.” Many of the literate men and women who had access to numerous popular tracts such as Thomas Kempis’ Imitation of Christ (written in the 1420s), also believed that they could achieve salvation by emulating the life of Jesus and contemplating the Bible’s mysteries, if they also took what they considered the most important sacrament of the Church—the Eucharist. From the perspective of the Church, the problem with this (again) was that it also undermined the theological significance of the Church and priesthood. In 1388, after the death of Pope Gregory XI, the College of Cardinals named an Italian bishop (Urban VI) as the new pope. But only months later, the Cardinals reversed their decision and appointed a French bishop (Clement VII) as the new pope. Urban VI, who refused to step down, responded by naming a new College of Cardinals and declared that he would rule the Church from Rome, Clement VII insisted that he was the rightful pope, and that he would rule the Church from Avignon. So began the “Great Schism,” in which the bishops of Europe declared loyalty to one pope or the other, and the two camps denounced each other as heretics. The split outlived both Urban and Clement, and the rival French and Italian papacies continued battling. 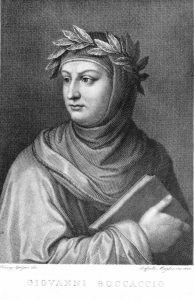 (Things became even more confusing when a gathering of bishops in Pisa appointed a third rival pope in 1409). The dispute was not settled until the Council of Constance in 1417, which we will discuss in a bit. The impact of all this infighting was to further discredit the Church in the eyes of tens of thousands of the faithful, which again helps us understand polar heresies of the 1300s. Most of Italy was engulfed in internal warfare and political anarchy in the 1300s. In Naples in the south, the King faced rebellions from his aristocrats, who faced uprisings from their serfs; in central Italy, several towns took advantage of the Babylonian Captivity to declare their independence from Papal temporal authority, which led to internal warfare; in northern Italy, the oligarchies that ruled Genoa, Florence, Venice, etc., fought among themselves for power at the same time that these cities’ lower classes staged their own rebellions. In the 1300s matters were perhaps even worse in Germany, where the weakness of Imperial power had encouraged internal warfare among regional princes. Warring between princes opened the opportunity for several cities to declare themselves independent of aristocratic rule, and for several lesser aristocrats to renounce service to their lords and declare themselves the independent rulers of their own fiefdoms. 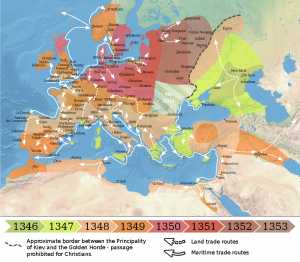 So in Germany, the 1300s brought further political fragmentation. 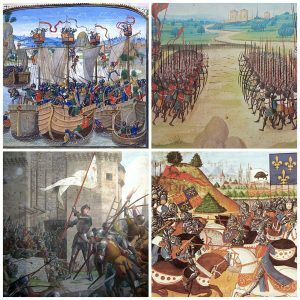 Although the French monarchy would come out of the Hundred Years’ War stronger than it had been before the war, in the 1300s the monarchy faced great challenges. The Valois kings found that despite their armies’ numerical advantageous, they could not crush the smaller but better armed and better trained English forces in the 1300s. The cost of the war helped spawn the Jaquerie and the Paris uprising of 1356-58, which directly threatened the monarchy’s survival. Moreover, several of the Valois kings of the 1300s were weak figures (and one is said to have been insane), and had difficulty enforcing the loyalty of their aristocrats. Not until the 1430s would the tide of the war turn in favor of France, which proved critical to the fate of the Valois monarchy. England’s monarchy faced its own problems in the 1300s. King Henry III (1216-1272) had faced a series of minor aristocratic rebellions, which had led his son Edward I (1272-1307) to crack down on the aristocrats (as much as possible given the Magna Carta) and strengthen monarchical power over the magnates. 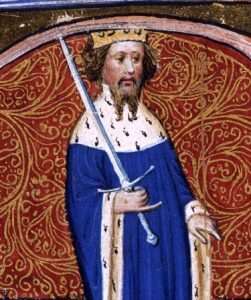 But Edward II (1307-1327) proved incompetent, and a conspiracy of powerful magnates led to his removal (and then murder) in 1327. Edward III (1327-1377) at first proved a far more capable ruler than his father, but by the 1360s suffered from senility. After Edwards’ son (the popular “Black Prince” Edward) died in 1376, jockeying for power between the great magnates increased. Upon Edward III’s death (1377), Richard II, still a boy, became King; one of the great nobles, the Duke of Lancaster (Edward III’s brother John), ran the monarchy behind the scenes; it was his tax policies that led to the peasant revolt of 1381. When Richard II came of age, he tried to restore royal control over the government; for this, he was removed and murdered in 1399. The throne was now seized by Duke John’s son, Henry IV (1399-1413). The stage was being set for the War of the Roses, between the House of Lancaster and the House of York. But we will return to that in a bit. In the 1400s the Black Death periodically revisited Europe and populations continued declining in many regions, but the most intensive demographic impact had already been felt by 1400. From that point to the mid-1400s, population slowly began to stabilize. A century of plague, hunger, and war had dramatically changed the relationship between supply and demand in the European economy. Agricultural production began recovering, and since the supply now exceeded the demand, the cost of grain fell. Ordinary people again could afford to feed themselves and their livestock. Urban populations who now paid less for bread (since grain prices had fallen), had more disposable income to spend on wine, or meat, or other “luxury” goods. The falling price of grain encouraged farmers to grow other, specialty crops (wine grapes, hops for beer, etc. ), to take advantage of the new consumer market. As a result, new patterns of regional economic specialization evolved (e.g., raising sheep for wool and growing flax in England, dairy production in Northern Europe, rye (grain) production in Germany, wine in France, etc.). In this way, the demographic disasters of the 1300s helped revive the agricultural economy and led to a dramatic expansion in commerce. That people had fled the countryside to the towns and cities, increasing the percentage of the population that was urban, also contributed to commerce. The two leading centers of the new, expanded commerce in the early 1400s were the Baltic Sea port cities of Northern German (joined in a federation called the Hanseatic League), and the north Italian cities. The Hanseatic league dominated European trade in grain, furs, amber, and other luxury goods from the North. The Italian cities dominated trade in imported spices and in textiles (silks, woolens, etc.). In both the Italian and the German trading cities, the new business practices of the 1200s (banking, bookkeeping, etc.) expanded and evolved. 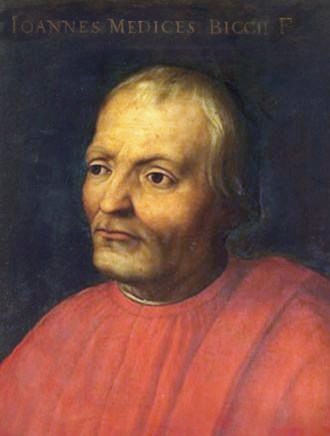 The Medici family of Florence extended its bank by establishing branches in other cities, which made it easier for merchants to transfer funds and credits. As increasingly expensive commercial voyages required large investments of capital at substantial risk, merchants in Italy and Germany developed joint-stock partnerships and forms of insurance contract. These techniques would prove critical to the growth of commerce and other business in the early modern period (1450-1750). Although in the early 1400s the European economy had begun to recover, in other aspects of European life instability continued for several more decades. One example of ongoing religious unrest was the spread of a popular heretical movement in Bohemia. In Bohemia (the Czech lands of the Holy Roman Empire), some of the English theologian John Wyclif’s ideas took root in the teachings of the charismatic preacher Jan Hus (1373-1415). Already by 1400, Hus had translated the Christian Bible into Czech and encouraged laypeople to study it for themselves, rather than rely on the clergy. Around 1408, Hus began echoing Wyclif’s views on the worldly corruption of the Church. Central to Hus’ theology was Ultraquism—the belief that in the Eucharist the laity should take both the bread (consecrated as Christ’s body) and the wine (consecrated as Christ’s blood). [In the medieval church, only the priests drank the communion wine]. Huss attracted tens of thousands of supporters among the poor, to whom his call for reform offered hope. The Hussite movement had political as well as theological dimensions. The movement received support from the Bohemian aristocracy, which hoped that Church reform would give them possession of Church-owned properties, allow them a greater share of tax and toll revenues, etc.. The Bohemian King also offered Hus support, hoping to take advantage of the Great Schism to win greater independence from the Papacy. 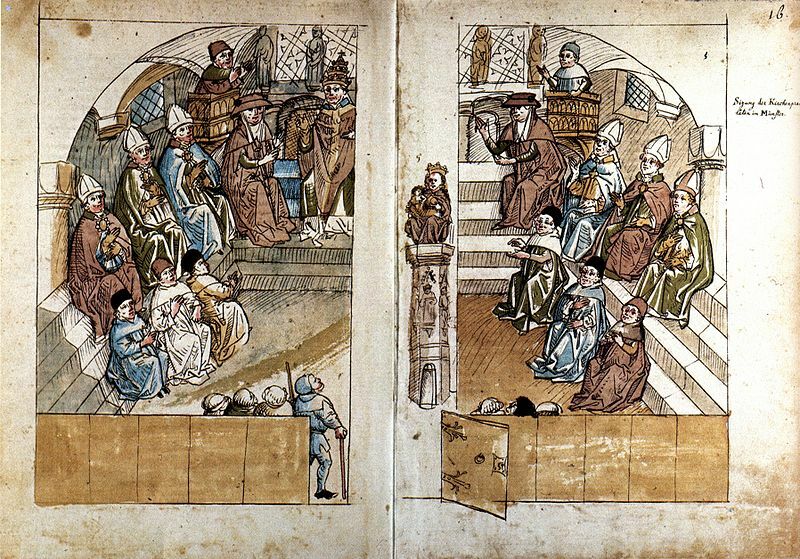 In 1415, the Papacy invited Hus to speak at the Council of Constance [a major gathering of prelates, called to discuss the Great Schism], ostensibly to explain his reform ideas. 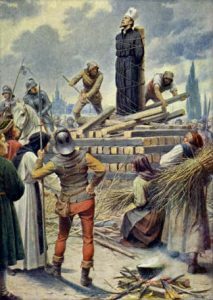 But instead of hearing him out, the Church hierarchy arrested Hus, tried and convicted him of heresy, and burned him at the stake. When news of Hus’ death reached his peasant followers in Bohemia, they rose up in rebellion against the Roman Church hierarchy. Again, they had support from aristocrats, who took advantage of the rebellion to seize Church lands. The rebellion on Bohemia challenged not the authority not only of the Papacy, but also of the Holy Roman Emperor. Therefore, the Emperor sent armies of German knights to crush the Hussites in 1420-1421. An army of militant Hussites known as the Taborites, however, destroyed the Emperor’s crusader knights. The Taborites argued that the murder of Hus was the work of the Anti-Christ, signaling the biblical apocalypse. They saw themselves as the servants of God battling the forces of the Devil–the Church hierarchy and the Emperor. (During the horrific events of the 1300s, rumors of the Apocalypse had become quite common across Europe.) Despite their military victories, the Taborites remained a minority in the Hussite movement. By the 1430s, aristocrats had taken over leadership of the Hussite reform movement and steered it in a more conservative, conciliatory direction. 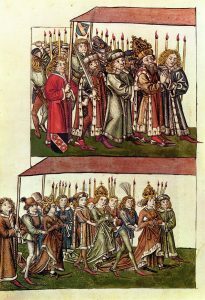 In 1434, the Church and the Hussites reached a concord: the Hussites would recognize the authority of the Church, and the Church would allow laypeople in Bohemia to drink the consecrated wine during the Eucharist. The Council of Constance, at which Hus had been arrested, had been called to find a solution to the Great Schism. In 1417, after two years of debate and discussion, the Council appointed a new pope (Martin V), whom the entire Church hierarchy and Europe’s Kings agreed to recognize. This finally brought an end to the Great Schism. But it did not end controversy within the Church hierarchy. The Council also resolved that in matters of Church governance, it itself was superior to the Pope. This began the so-called “Conciliarist Controversy”—the debate over whether the Pope or the council of prelates exercised sovereignty over the Church (in other words, was the Pope an “absolute monarch” or an executive appointed by the council of prelates). Between 1417 and 1449, the Papacy and the Church Councils wrestled each other for dominance over the Church. By 1449 the Papacy won this battle by gaining support from Europe’s temporal rulers. The papacy had agreed to concordats with the Kings of France, England, etc., under which the kings and princes would again appoint bishops and other high ecclesiastical officials in their “local” [national] churches. The Papacy had consolidated its hold over the Church, and now concentrated its energies on strengthening its own temporal rule in central Italy. During the decades of the Church’s Conciliarist Controversy, the ongoing war between France and England (the Hundred Years’ War) again seemed to threaten the very existence of the French monarchy. In the 1420s and early 1430s, aristocrats in the central French region of Burgundy had allied themselves with the English, which gave the English control over almost all of northern France. 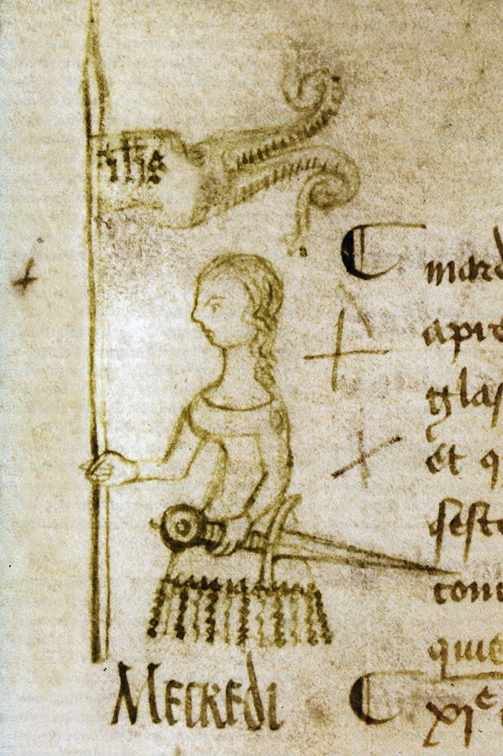 In 1429, the prospective French King Charles VII turned command of his army over to a young peasant girl, Joan of Arc. 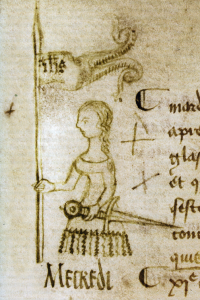 Joan claimed that God had spoken to her and ordered her to lead the French army against the English. Joan’s conviction that God would give her victory seems to have bolstered the morale of France’s armies, and under her leadership France won a series of victories over the English in 1429-1430. (This allowed Charles to be formally crowned King.) In 1430 the Burgundian aristocrats captured Joan and turned her over to the English, who convicted her of witchcraft and heresy and burned her at the stake. This did little to help the English cause. If anything, Joan’s “martyrdom” had seemed to rally the French armies, which again and again defeated English forces in the early 1430s. Moveover, the Burgundians proved fickle allies and joined forces with Charles VII in 1435. 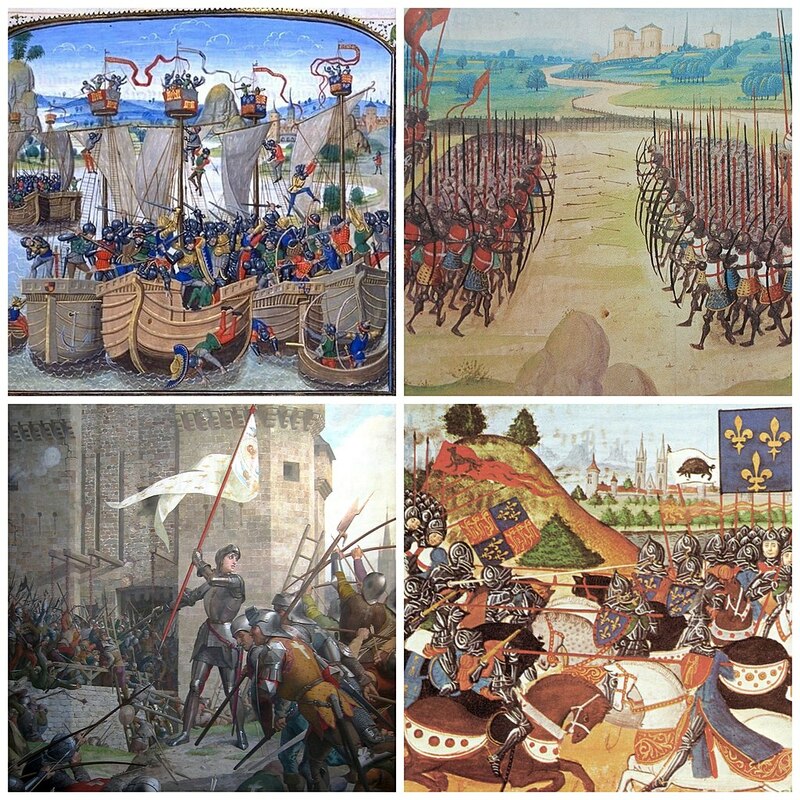 The French armies then slowly but steadily drove the English back, until French forces ended the war in 1453 by defeating the English at Bordeaux. The Hundred Years’ War was over and the French monarchy had not only survived but had grown stronger. Under Charles VII (1430-1461), and then his successors Louis XI and Louis XII (1461-1483, 1498-1515), the monarchy broke the independence of the Burgundian aristocracy and increased the authority of the central government over the provinces. As a result of their victory in the Hundred Years’ War, the French finally had driven the English out of France (except for the tiny territory of Calais on the English Channel, which they held for another hundred years). England’s fortunes in the Hundred Years’ War had declined steadily partly because of the very erratic leadership and policies of English King Henry VI (1422-1461). British aristocrats, already alienated by Henry’s tyrannical tendencies and his refusal to recognize the aristocratic rights protected by the Magna Carta, laid blame for England’s defeat entirely at Henry VI’s feat. In 1455 a civil war erupted between the faction supporting the Duke of Lancaster (King Henry VI) and the faction of the Duke of York (Edward, Henry’s cousin). This civil war has since become known as the War of the Roses (after the symbols on the coat of arms of the two ducal houses: Red = Lancaster, White = York). For half a decade, England’s aristocrats chose sides and slaughtered one another on the battle field. In 1461 the House of York won the war and Edward became King Edward IV (1461-1483). The end of the War of the Roses did not, however, end the struggle for power. After the death of Edward IV (in 1483), his brother Richard (Duke of York) seized power (he then arrested and murdered Edward’s sons). During the brief reign of King Richard II (1483-1485), the House of Lancaster mounted a new rebellion. In 1485 the Henry Tudor, the Duke of Lancaster, defeated (and killed) Richard II and became England’s new king, Henry VII (1485-1509). 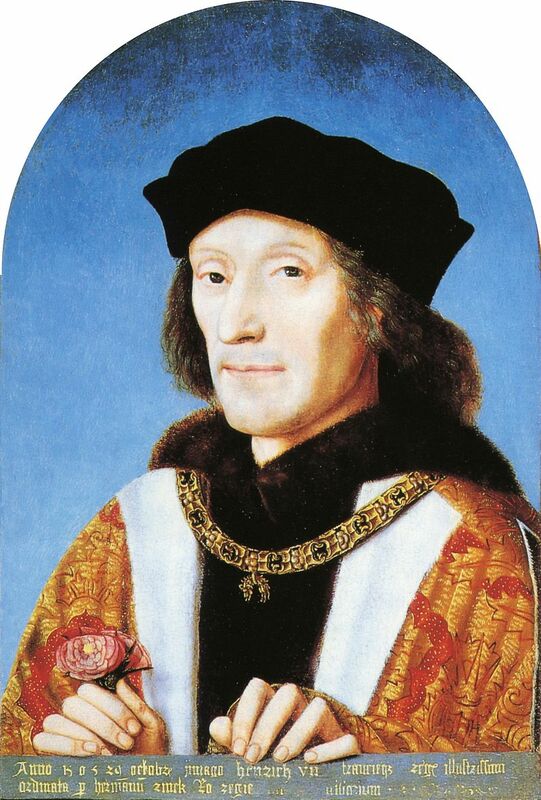 Henry ended the civil war and made peace with the House of York by marrying Edward IV’s widow. Under Henry VII, the English monarchy became more stable and more powerful. Henry again established the King’s dominance over the aristocrats (while giving greater attention to their rights than had Henry VI) and strengthened the state’s finances (in part by avoiding wars). Under his son, Henry VIII, the monarchy would become even more powerful. 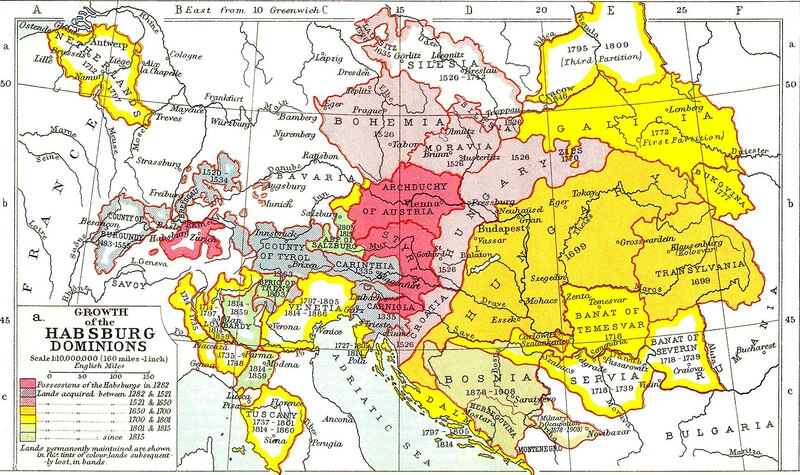 Like France and England, the Holy Roman Empire experienced continuing political turbulence in the early 1400s. As we have seen, the Empire had fragmented into a patchwork of autonomous principalities. 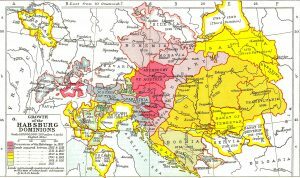 By 1450, however, two principalities had begun to emerge as dominant: Brandenburg-Prussia, ruled by the Hohenzollern dynasty; and Austria, ruled by the Habsburg dynasty. These two kingdoms would dominate German history into the modern period. Elsewhere in Central Europe, in Northern Italy, three city states—Florence, Milan, and Venice—had achieved dominance in the early 1400s. The internal warfare that had plagued the north Italian cities had died away, and each of these powerful cities had evolved its own models of urban government. In Milan, a princely dynasty had seized power from the city council and claimed the right of absolute rule; in Venice, the city’s leading merchants ruled as an oligarchy through the city council; and Florence technically remained a republic, although behind the scenes again the Medici and the leading merchant families dominated the city government. By the 1450s these three city states had conquered almost all of northern Italy. From the 1450s until the end of the 1400s, Italy experienced a long and profitable period of peace, thanks to an agreement between the northern city states, the Papacy (which ruled most of central Italy), and the Kingdom of Naples (which ruled southern Italy). This relative peace would contribute to the great outpouring of artist creativity in Italy in the 1400s. Naturalism also emerged in other aspects of the arts, such as sculpture and painting, although here the subjects generally remained religious. Naturalism in painting emerged first in northern Italy. Painters like Gottio (1267-1337), who worked in Florence, sought to imitate nature in their painting and strived for naturalistic effects that contrasted strongly with the more abstract and stylized art of the early middle ages. A bit later, in the mid-1400, the style of naturalism took root in northern Europe, in the work of painters like Jan van Eck and Hans Memling. The 1300s and early 1400s were also an age of technological advances, some of which would have huge consequences in later periods. 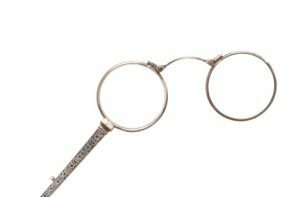 Lens grinding, for instance, reached a level of development that made both eye glasses and telescopes practical and useful. The later, like the new magnetic compass, would be applied to navigation and helped make possible the “Age of Exploration.” Clock-making technology advanced considerably in the 1300s and 1400s; clocks not only were important in the evolution of machinery, but they began to transform the ways people understood and experienced the passage (and use) of time. New paper-making and printing technologies made it cheaper and easier to produce books in large numbers and “fed” a growing reading public hungry for both religious and secular works. And a “new” invention from China, gunpowder, revolutionized warfare by making possible cannon and firearms. The implications of all of these new technologies would become much clearer in the early modern period, beginning in the late 1400s. 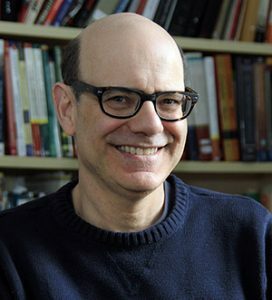 Originally published by Michael C. Hickey, Bloomsburg University of Pennsylvania, open access, republished for educational, non-commercial purposes. This entry was posted in History, Medieval, Middle Ages. Bookmark the permalink.